Athanasia Kyriakakos (Sia) remembers dancing with her father years ago at a Greek party. Passionate toasts were made. Plates crashed to the floor in celebration, making the floor slippery. A giant human spiral of people wove in and out of concentric circles, the community stomping out a quickening rhythm. Those on the side lines clapped in time. Sia was deeply entrenched in a mesh of voices, the ding of the plates continuously breaking as dancers stepped on them or kicked them, blending with the affirming crescendo of pounding feet, spinning lights, and bouncing colors of fabric. As she remembers it, each person was unique yet a collective trust kept the whole moving. At this moment, Sia recalled a large metal sculpture she had welded and hammered alone during her undergraduate days at the Maryland Institute College of Art (MICA) years before. The fifteen by fifteen foot sculpture was made out of cut steel triangles curled into spirals. Wet clay covered the steel floor, inviting people to walk through it carefully because it was slippery. Fabric was woven throughout like netting. She realized she had unintentionally recreated this spiral in her work. For years Sia had tried to escape that circle by defying her parents’ teachings to make her a good wife, housekeeper, and mother. She was adamant about keeping her last name at the age of six. And even when when her parents proclaimed, “NO MONEY, NO ART,” art found Sia. MICA offered her a full scholarship. She made a point to choose metal. She was strong and independent no longer restricted by tradition, but cracks began to happen. By the time she pursued an MFA at the School of the Art Institute of Chicago she could no longer work by herself. Sia needed community. She began creating art spaces that invited people in by design. She would make coffee for them. Read their fortunes. Soon her spaces began to look like her grandmother’s porch, her Greek grandmother, the one whose lap Sia sat on as she hand spun wool she had dyed by hand and late wove. These communal structures earned her a Fulbright to Greece and throughout Europe to work on community and art space. All this time she had thought she wanted to separate herself from the traditions, the expectations, and the gendered roles of her Greek upbringing, but the expectations to extend her family, to build community, to create a home was the medium that chose her and how she came to understand herself. The art had been the unconscious physical manifestation of this idea. She had been recreating the spiral all along, defining her place within, but on her terms. 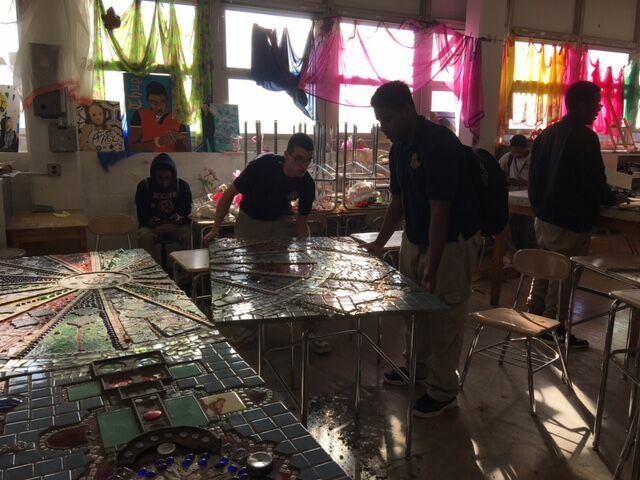 Choosing to teach in Baltimore City after representing Greece in the 2003 Venice Biennale (a collaboration with Dimitris Rotsios under the name of intron) was about consciously using her medium — extending her family, creating a home, building community — in a classroom. 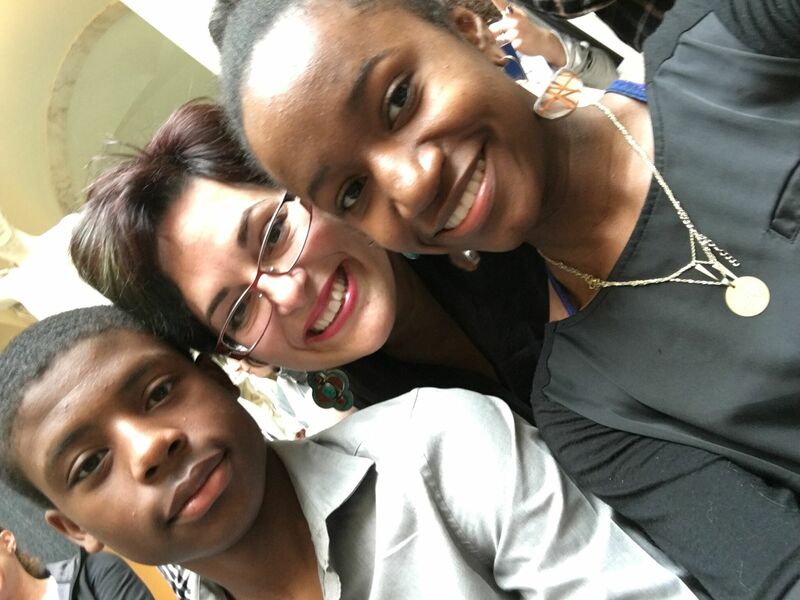 And now, Sia’s work at Mergenthaler Vocational-Technical High School (MERVO) has earned her the 2016 Baltimore City Teacher of the Year and 2017 Maryland Teacher of the Year. It took her to Colombia, South America as part of the International Research and Exchange Board. Soon she will head back to Greece via a second Fulbright award to work with the refugee community. The following is a conversation with Sia about her teaching and her evolving practice as an artist. Why did you choose to teach in Baltimore City? My parents were political and economic refugees from Greece, so Baltimore is ‘coming home’ for me. My family owned Mamma Mia’s a pizzeria on N. Broadway and Monument. Parkville High School was where I took my first official art classes and where I received tremendous support to develop as an artist. It changed my life. I wanted to give that same rigorous and supportive experience to my students. I grew up surrounded by Black culture and I love it. I felt at home with the students in Baltimore City. But I had culture shock coming back [as a teacher] because I never thought schools in the United States in the 21st century would not have tables and books. 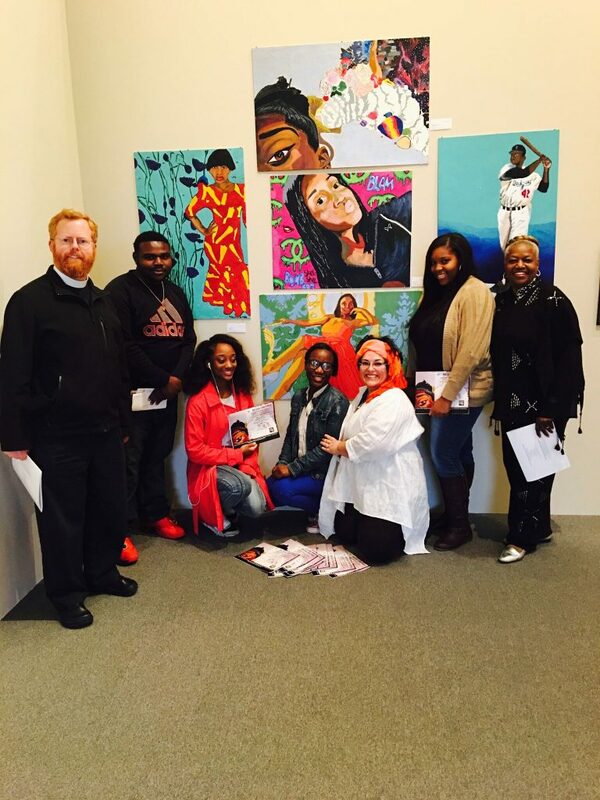 It became my mission to teach art and be an advocate for change. It is not about pouring money in but about changing laws to dismantle inequitable systems to create access instead of barriers. How are you able to have such high impact? I was ready. I was kicked out of MICA’s teacher program years ago. In order to be in the temple of children you have to give yourself completely. I wasn’t ready for that. I wanted to be an artist. The things I do are about self investigation. In order to be a good teacher you need to build relationships. You have to give students time and be vulnerable yourself. I am not building relationships as a strategy. I am building relationships because I want to have those relationships with my students. I want to have meaningful connections with them. I want to understand them and see who they are and where they come from. I want to share who I am with them. And when you do that— it is magical. What has fostered your work at MERVO? The administration supported me financially. I gave them a huge budget. The same budget I gave to the five principals in my previous three schools (all of which closed). Mr. Rivers was the only one to grant it. I didn’t have to beg for money. I had money to do my work and felt loved and supported as a teacher every step of the way. They never said ‘Oh, it is not a tested subject we are not going to give it any support.’ I was also allowed to take students out of school and put them in shows all over Baltimore so other people could see their work and their potential. How does the process look from the student’s side? The class is about building trust. Day one we all write about who each of us is and read our writing aloud. Art is a process of editing, re-editing, and building that up but always in a deeply loving way. I give them praise but then ask them to do it again. Students begin to adopt extremely high standards. They learn to consult each other and develop an eye for what is missing from listening to me give them feedback and push them to go deeper. The projects are not finished until I say they are done. Students hate me and sometimes they cry and want to give up. Then they come back to work on it. When students are done they are allowed to sign their work. I always take a photo of them when they sign their work. Their pride shines right through them. Did any go on to pursue art? No. I have students for one semester in eleventh or twelfth grade for the mandatory art credit requirement to graduate a Maryland High School. Twenty of those days are taken away for testing. I am not even an elective they can take in freshman year. Most are coming to me drawing at an elementary level. I have one semester to cover developmentally ten years of learning. Students need instruction to develop skills. Art schools require art for four years with six or seven classes and a portfolio of twenty pieces. When they are done with me they have two or three pieces that are portfolio ready. 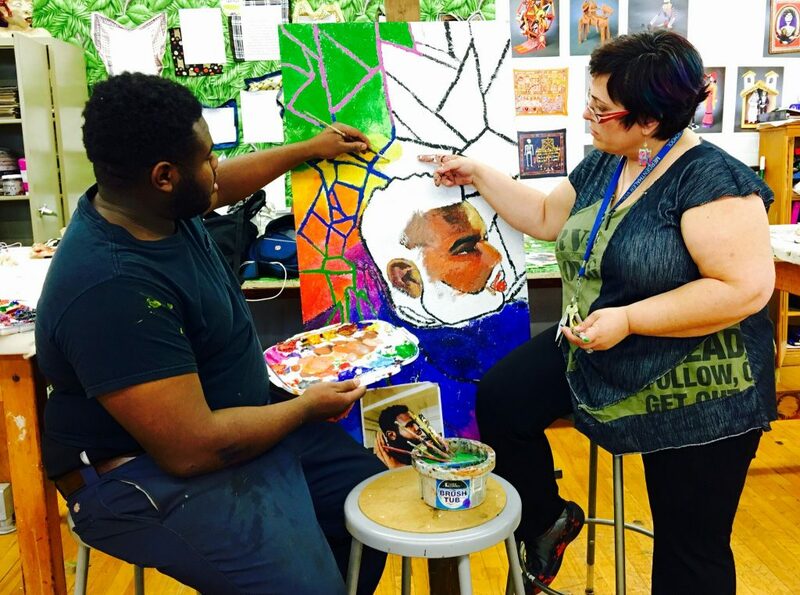 Baltimore City has not been invested in art throughout high school. Dr. Santelises is making a big push to teach the whole child. Art is a big part of that but unless it is backed up by money it is not going to happen. Their first line drawing shows me how far I can take them developmentally. I begin with a sculpture medium because it is freer and very expressive and then go into something really tight like charcoal drawing. That process is grueling. I then cover basic photography because they all want to know how to take better photos. Painting is beautiful but I can only do that if I have more time. I focus on three in-depth projects and do them very well. At first students are afraid and have no confidence but in the end they have a deep understanding of the medium. I also don’t say I’m teaching how to draw. I say I am teaching you focus, perseverance, and patience. These are life skills needed in order to be successful at anything. It is not about art it is about their life and having something beautiful in their lives. I have them write their goals with steps on how to get there. Process is everything. I want them to see themselves as powerful and existing in this greater community, in this city, in the world. That is what I am preparing them for. That is what their artwork is about. It is about them having self knowledge, seeing themselves as powerful, existing in the greater community as positive influences of tomorrow.